Here is a list of different golf putter types arranged by design, balance and material: Click through for our independent reviews of different models in each category and advice on where to buy them at the best price. Designed by Karsten Solheim as one of the follow ups to his original Ping 1A putter, the Anser is a simple but highly effective putter which was revolutionary in its design. It was the first putter to have a cavity hollowed out in its back. This has the effect of distributing much of the weight of the putter head to the heel and toe ends, which makes the sweetspot larger. Because of this you get far less twisting of the face on an off center strike and this makes the anser one of the most forgiving golf putter types. Any putter that has this overall square shape with heel and toe weighting is thought of as an Anser style. Click here for more info on Anser style putters. Blade putters are the traditionalists weapons of choice. Jack Nicklaus won almost all his majors with this style of putter. They are heavily toe weighted putters, so will only really suit an open-square-closed stroke. Click on the link below to find out which blade putter is the best with www.Best-Putter.com's independent, hands-on reviews, you'll also find where to buy them at the best prices! Click here for Best-Putter.com's independent reviews of blade putters. A center shafted putter is exactly what its name suggests - a putter where the shaft inserts into (more or less) the center of the head. They are usually face balanced, so they will best suit a straight-back-straight-through stroke. If your putting stroke is more of an in-square-in stroke, then you may well be better off with an anser style putter or a blade putter. For our independent review of numerous center shafted putters, click here. All conventional ideas about how a putter go out the window when companies design a futuristic putter. They are often enormous putters from face to back and often have shaft attachments well behind the face of the putter. Futuristic putters are the most technologically advanced and forgiving of the golf putter types. You'll find most companies claiming a high "moment of inertia" (often abbreviated to MOI) on their futuristic putters, meaning that the putter resists twisting if you strike the ball off center. Whether you think the weird looks are worth it is up to you! 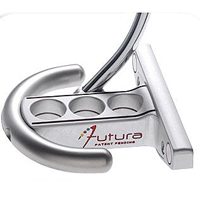 Click here for loads of reviews of futuristic putters. Mallet putters are called mallet putters because they look a bit like a croquet mallet - a solid lump on the end of the shaft. If you cut most modern mallet putter heads open you'll find that they're hollow with weights in the heel and toe of the head. This gives them a larger sweetspot and less likely to twist as a result of an off-center hit. Mallet putters are almost without exception face balanced, so will best suit a square-to-square stroke. Click here for Best-Putter.com's reviews of mallet putters. An offset putter is one where the putter face is set further from the hole at address than the shaft. This achieved by either having a kink in the hosel (often called a plumber's neck" hosel) or a gentle curve in the shaft. The vast majority of putters are offset. The reason is that it feels natural and almost automatic to have your hands ahead of a putter whose face is offset. When you lead the putter through the stroke with your hands you will almost certainly putt better because a putter which is being led through the stroke twists less on off-center hits - Click here for reviews of offset putters from many different manufacturers. Onset putters are the exact opposite of offset putters. As you can just see in this picture the face of an onset putter is closer to the hole than the point where the shaft inserts into the putter head. The advantage of this type of putter is that you can see the whole of the putter blade when you address the ball and this can really help with your alignment. Onset putters are quite hard to get hold of, however. You'll find a list of several options if you click here. 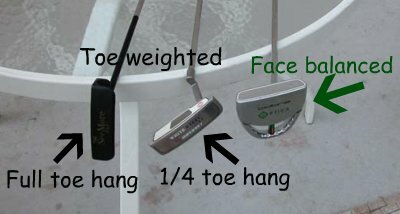 When a putter is face balanced, it means that the putter head is equally weighted between the toe and the heel relative to the point where the shaft enters the head. To test whether your putter is face balanced, lay the shaft of your putter across your palm. If the face lies absolutely horizontal, pointing up at the sky, then it's a face balanced putter. The point of face balancing is to restrict the amount which the clubface opens and closes as you swing back and through. Therefore you definitely want a face balanced putter if you are trying to swing the putter on a straight back, straight through line as putting teacher Dave Pelz suggests is best, but other teachers dispute. Click here for reviews of face balanced putters from many different manufacturers. The weighting of a toe-weighted putter encourages the putter face to close through the ball. This is ideal if your stroke is an open-square-closed stroke (also known as a "barn door" stroke). The style of stroke and a toe weighted putter go hand in hand and reinforce each other. However, if you're trying to putt with a straight back straight through stroke, a toe weighted putter is the last thing you want. Click here for our reviews of toe-weighted putters. Insert putters are the only one of the golf putter types which have a different material (the "insert") inlayed into the face. You actually strike the ball with this insert material and not the material used to make the main part of the putter head itself. Insert materials can be either hard or soft and you see manufacturers making all sorts of claims about the effect their inserts have on the way the putter feels, although the most common claim is that it softens the feeling of the ball against the putter head. Odyssey golf's White Hot and Ice White inserts are the market leading inserts. Click here for reviews of insert putters. Milled putters are created from a single block of metal which is cut and shaved using a milling machine until it's the exact shape desired. You can tell milled putters from the arc shaped marks on the putter face made by the milling machine. Milling is the only way to make putters which have complex shapes featuring cavities and scoops out of 303 stainless steel which is generally accepted as giving the best feel of any putter head material. Since milling is more labor intensive than casting a putter head (see below), milled putters are generally the most expensive of all the golf putter types. Click here for reviews of milled putters from many different manufacturers. If you're looking at a complex shaped head (i.e. one that includes cavities etc) and it doesn't have milling marks (see pic above) on the face of the putter, then you're most likely looking at a cast putter made out of manganese bronze (a dull gold color), beryllium copper (a darker red or brown clay color) or carbon steel (a silver color). Some of the greatest putters in history have been cast (the early Ping Anser and Ping Zing to name just two), so just because top pros feel they get slightly more feel out of a milled putter, doesn't mean you and I can't putt well with a cast putter. The other major advantage at the moment is that all of these great putters are now cheap on the second hand market. Because manganese bronze in particular is extremely durable, you should find them in good condition too. If you're strapped for cash, this is a great golf putter type to go for! Not sure which of the golf putter types is for you? Read our article on choosing a putter to find out what is!